This image certainly looks like a blurry mess, but it actually shows some footer placement for Carowinds' next big thrill. Credit goes to the folks over at Carowinds Connection for the find. It seems the park has put some plans out to bid for major changes to the parking lot entryway and toll booths. Included in the plans for those changes are some footings and a ride tunnel that would appear to be for a new coaster. And let's face it, we know a new ride is coming. That was leaked some time ago, but the type, size, etc, has been a mystery and will remain one at least for now. All the above image tells us is that the ride will indeed run out past the park's main entrance, appearing to then turn around and head back the way it came. 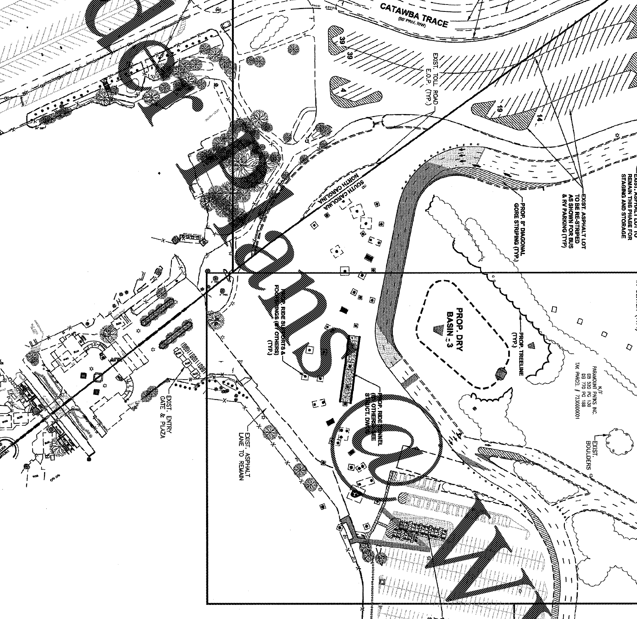 Also note that the footings for the ride stop being drawn at the state line, I suppose that the plans for the parking lot changes do not need to include them. If you click over to Carowinds Connection you can see plenty more .pdf files of the plans, but you won't find any more details on the ride. It's a start!